DEC 30th 1839 Cover addressed to Edinburgh with, on the front, a very fine LONDON UNIFROM MANUSCRIPT '4' IN BLACK. 1840 Entire addresssed to London showing a very fine SHAFTESBURY UNIFORM HANDSTRUCK '1' IN RED, DT 481. 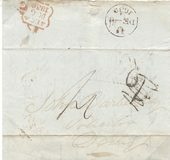 1840 Entire from Brighouse to Calverley near Leeds showing a very fine BRIGHOUSE/PENNY POST in BLUE and a HALIFAX UNIFORM HANDSTRUCK 'Pd 1' in RED, YK 585 and YK 1227; also showing IN MANUSCRIPT "Misdirected to" LEEDS. ATTRACTIVE. DEC 17TH 1839 Entire addressed to Dublin showing a very fine PETERBOROUGH UNIFORM MANUSCRIPT '4' in black. 1845 Entire from Chester with, on the front, a Uniform handstruck ‛1 containing a letter from a "debtor prisoner", Mr Hilliard, who describes "...the three degrees of Gentlemen..." who are also in prison. 1840 Entire to Beverley showing a very fine HULL UNIFORM HANDSTRUCK '1D.' in red together with a very fine HULL SKELETON DATESTAMP FOR 'HULL/FE/3/1840/+" in BLUE - VERY RARE and believed to have been used on this day only. 1842 Entire to Wymondham showing a very fine THETFORD Uniform Handstruck circular frame 1d, NK 425. 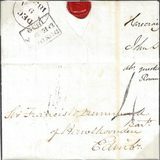 1840 Entire addressed to Hatton Garden, London showing on the front a very fine ATTLEBOROUGH UNIFORM HANDSTRUCK "Paid/1d." in RED, NK 20. 1848 Cover to London showing a very fine GUERNSEY UNIFORM HANDSTRUCK '1' prepaid in Red, SG GC 13. DEC 23RD 1839 JERSEY UNIFORM MANUSCRIPT '4' IN BLACK - Rare for the Channel Islands. 1839 10 DEC CHESTER UNIFORM HANDSTRUCK 4. Entire addressed to Acton, nr Nantwich, showing on the front a very fine Chester Uniform Handstruck 4 in black. RARE. 1841 Cover to London showing on the front a very fine SUNDAY 'TOMBSTONE' DATESTAMP, L 123, used in 1841-2 only. 1840 Entire used locally showing a very fine NORTHAMPTON UNIFORM HANDSTRUCK 'P1D' in red, NN 149. 1839 DEC 10TH Entire addressed to Blandford showing a very fine WIMBORNE UNIFORM MANUSCRIPT '4' in black. 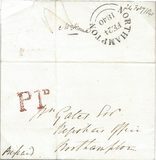 1845 Envelope to Brighton showing a very fine WINDSOR UNIFORM HANDSTRUCK 'PAID/1' in red, BR 528. 1839 Dec 28th Uniform Handstruck 4 Entire to Holicombe, "Lilhook" (Liphook), showing a very fine Carlisle Uniform Handstruck 4. 1839 DEC 12TH EDINBURGH UNIFORM HANDSTRUCK '4' on Entire to Castle Douglas. Krkwood Impression S4-5. 1839 DEC 9TH DUNDEE UNIFORM HANDSTRUCK '4' on Entire to Edinburgh. 6th Dec 1839 UNIFORM 4d POST, Handstruck '2' erased and Manuscript '4" applied. 1840 Entire to London with, on the front, a very fine IPSWICH UNIFORM 'PAID/1' in red. 1839 DEC 10TH DUBLIN UNIFORM PREPAID MANUSCRIPT '4' IN RED on entire to Cork. Scarce Prepaid. 1850 Entire to Beverley showing a very fine UNIFORM HANDSTRUCK "YORK/1D/PAD" in red, YK 3345. 1849 Entire to Henley in Arden showing a superb CHESTER UNIFORM HANDSTRUCK 'd1' in red. 1840 JAN 1ST Entire to London showing a LINTON UNIFORM MANUSCRIPT '4' in black. 1839 DEC 19TH Entire to London showing FARRINGDON UNIFORM MANUSCRIPT '4' in black. 1839 DEC 31ST EDINBURGH UNIFORM HANDSTRUCK '4' on Entire addressed to York. 1841 Interesting Printed Advertising Letter Sheet for CHICHESTER MILK PUNCH addressed to Basingstoke and showing a very fine CHICHESTER UNIFORM HANDSTRUCK 1 in Red. 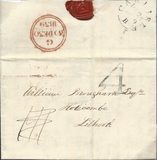 1848 AUG 29TH GUERNSEY UNIFORM HANDSTRUCK '1' PREPAID IN RED on envelope to Liverpool. VERY SCARCE - THIS BEING THE LATEST KNOWN DATE OF USE. DEC 12TH 1839 Entire to Wiveliscombe showing LONDON UNIFORM MANUSCRIPT "P4" in RED. VERY SCARCE PRE-PAID. 1841 MASHAM/PENNY POST in Red/Yellow. 1844 1d PINK ENVELOPE from LONDON to MIDDLEHAM showing a very fine Type 5 MIDDLEHAM/PENNY POST. 1842 YORK UNIFORM HANDSTRUCK "Pd. 1. ", YK 2344. A SCARCE TYPE.